When a door rubs against the floor every time you open it, it's time to trim it. The method you use to trim the door depends on the type of door you have. 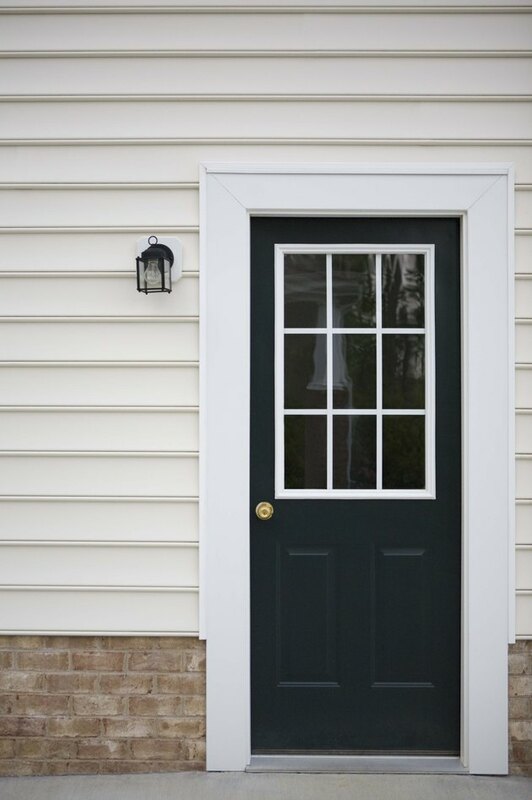 Unlike slab doors, which are made of a single piece of material, composite doors are usually made of glass-reinforced plastic with a foam core. The foam core makes the door much lighter than a slab, which helps with ease of installation, but it makes trimming the door a bit trickier. Trim doors that rub against the floor or door jamb. Measure the amount to be trimmed while the door is still hanging on its hinges. Get down on the floor and determine where the door needs to be trimmed by opening and closing it. Sometimes you need to trim just one side of the door because of the way the house has settled. Use a pencil to mark the areas that need to be trimmed. You will make more definite marks on the door later, but these approximations serve as your guide. Remove the door's hinge pins by putting a screwdriver underneath the pin and hitting it with a hammer. Once the pin starts coming out the top of the hinge, just pull the hinge pin out. Take the door down, and lay it on a workbench or across two sawhorses. Refer to the marks you made on the door in step 1. Lay out a yardstick or long ruler along the original marks you made, and draw a line across the door indicating where you will trim. Keep in mind that a composite door has solid wood only at the bottom and top of the door. If you need to trim more than an inch or two, trim both the bottom and the top of the door so you don't have to cut into the foamy void in the center. Hold your yardstick along the line you just drew, and run a utility knife along the line several times to cut through the veneer. Composite doors often have veneer finishes that splinter when you cut through them. Scoring the veneer helps you make a clean cut. Lay a piece of scrap lumber across the door that will serve as your guide as you make the cut. When you line up your circular saw against the board, the blade should be aligned with the line you scored. When the scrap lumber is in place, clamp it to the door with C-clamps on both sides of the door. Use a circular saw to cut along the line you just scored. Sand the cut edge of the door with sandpaper, and put a coat of paint or polyurethane on the raw wood to protect it from water and warping. Hang the door back on its hinges.